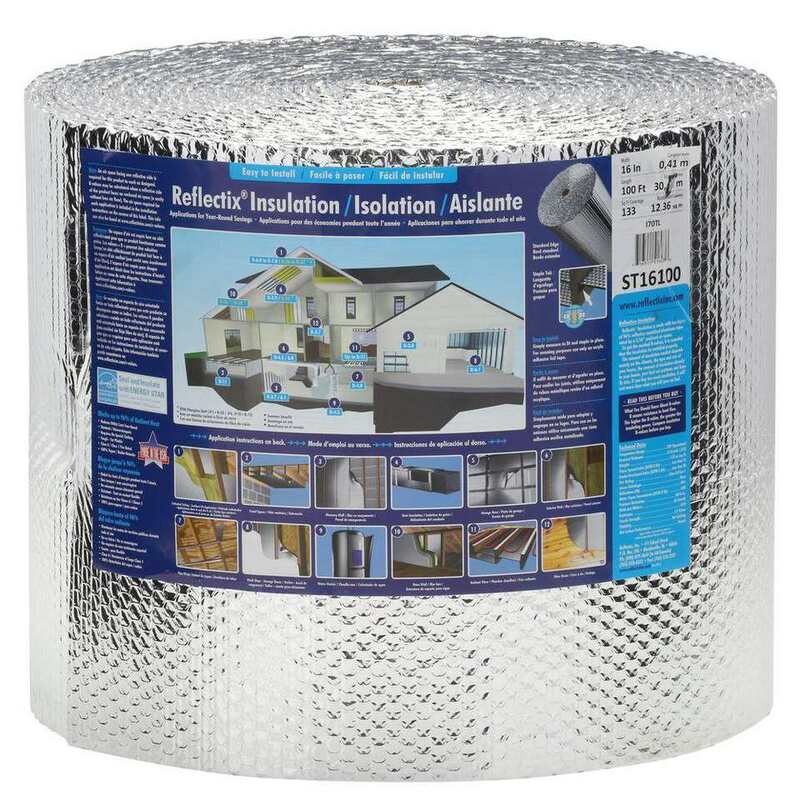 Found in major outlets such as in Home Depot's insulation aisle, Reflectix comes in tightly spooled rolls of 25' by 2' shiny, reflective, foil-look bubble wrap-texture insulation in plastic bags. The idea is that this thin material can act as a type of insulation in tight spaces where you cannot put thick fiberglass insulation. There is no metal content; it is all plastic. When you are shopping for insulation, all of those giant bales of fiberglass, rigid foam, and even denim (recycled jeans) can look daunting. They are difficult to carry home, and if you have a car it's that much harder. Once you get them home, you have to suit up from head to toe to protect yourself from all of that itchy fiberglass. Is there a better way? Does Reflectix offer up a reasonable substitute? Not exactly. Reflextix is not a fiberglass alternative. It is a different kind of insulation. For example, the R 6.1 masonry value is only good if you provide two 3/4" airspaces, one between Reflectix and the masonry wall and another space between the drywall and the Reflectix. If you've got air space, why laboriously suspend a shiny bubble wrap in the center of it when you can just fill it with far more effective fiberglass batt insulation? That is a question you will need to answer yourself. In some cases, Reflectix squarely falls into the category of better-than-nothing. You might have a cold workshop with heat escaping through the roof. Stapling a layer of Reflectix along the rafters will cut down on some heat loss, but not as well as would fiberglass batt. Yet if you can't stand the idea of wrestling with fiberglass batt over your head, Reflectix is an alternative. Also, its reflective surface would give your shop more ambient light. Also, it can help with any areas where cold air is blowing into your house. While caulking is the recommended procedure for this kind of thing, there may be situations where a large expanse of Reflectix will stop airflow. In the end, Reflectix is exactly what it says it is. All of the information about Reflectix is laid out on the label, and their site is highly informative. You would never use it for wall cavity insulation--why spend your time tacking this stuff to the center of your wall studs? But you might wrap pipes with it or use it for less-critical areas, like shops. It's popular for uses outside of the home, too. People use it in trailers or for camping or to insulate the insides of coolers. The key to using Reflectix properly is that you should take a little time to understand how reflective insulation works in the first place. The Reflectix site provides a great range of information about this, and about how it differs from other types of insulation. Michael Tokarski of Reflectix likens his product to a Thermos jug, in that it reflects heat back rather than a mass insulation such as fiberglass.